I wrote this entry in March, but wanted to post it when I had a "do-over" on the apple pie, which was today (picture is above). We went apple picking, and I had some lovely, extra large Mutsu apples that were begging to be in a pie. Second time's a charm. 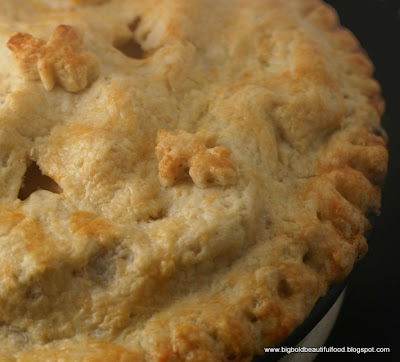 By the way, if you think using vodka in a pie crust is a little whacky, think again. Since vodka is an alcohol, it evaporates during cooking and leaves the flakiest, tender dough. This is definitely a must-try recipe. My friend Coleen loves apple pie. It's her favorite. She lives an hour away in another state and was coming over today with her daughter to spend the weekend with us. When talking to her on the phone, she mentioned driving out to a farmstand that is an additional 45 minutes from my house to pick up an apple pie. I thought to myself, "Coleen is going to drive almost 2 hours to get pie? That's crazy." So I surfed on tastespotting.com, found a recipe at folkmann.ca, hit the grocery store and picked up the requisite ingredients. I am admittedly not a baker. Baking requires reading recipes and actually following them, something that doesn't meld well with my laissez faire cooking style. But this was for Coleen, one of my dearest friends, so I jumped right in. I have never made a double-crusted pie before. My mother-in-law is the piemaker, and when I was going through the recipe, I found myself wishing that I had paid attention when she was making pies (apple, pumpkin, and pecan) during the holidays and during the summer (blueberry). I got through the dough mixing -- I've made galettes before, which are free form pies (no pretty edges required). I even made the pie filling, no problem. Rolling out the dough? That was okay too. I got kind of stuck when it came to taking the rolled dough and putting it in the pie pan. What was the edging on the bottom layer supposed to look like? How was the top pie crust supposed to go on? How was the crimping to go? How were the cut outs supposed to work? Since pie crust waits for no man, I just winged it, as you can see from this picture. Poor ugly pie. Homely looks aside, the pie tasted just fine. The vodka pie crust was as flaky as flaky can be, and the filling was firm and not runny, sweet and redolent with the aromas of cinnamon and nutmeg. Coleen mmm-ed her way through her first slice and went back for another. Thank goodness, she didn't miss her farmstand pie. I'm definitely going to have to do a do-over as a chance for redemption. The second time around, I will reduce the cinnamon and nutmeg -- I actually grated both the nutmeg and cinnamon, so the flavors were pretty strong to my palate -- reduce the sugar a little bit, and add a squirt of lemon juice to the filling. With the crust, I have watched some apple pie making videos on ehow.com and am armed with new knowledge on how to place the top crust on the pie and flute the edges. The great thing about the videos was that the demonstrator had a series of mishaps (ripped pie dough, thin edges, etc.) while filming and showed how to fix them along the way. I don't know if I'll ever be a master baker, but making pie every once in awhile for a friend? Sure thing. 1. Process 1 1/2 cups flour, salt, and sugar in food processor until combined, about 2 one-second pulses. Add butter and shortening and process until homogeneous dough just starts to collect in uneven clumps, about 15 seconds (dough will resemble cottage cheese curds and there should be no uncoated flour). Scrape bowl with rubber spatula and redistribute dough evenly around processor blade. (I mixed it by hand and it turned out fine.) Add remaining cup flour and pulse until mixture is evenly distributed around bowl and mass of dough has been broken up, 4 to 6 quick pulses. Empty mixture into medium bowl. Roll out one disk of dough and place it into 9″ pie pan. Press firmly around edges to adhere to pan. Fill pan with apple mixture arranging apples however you please. Roll out second disk of dough. Brush top crust with egg. Cover with foil and bake for additional 20 minutes. I wonder if Ju would use Cognac:)? I never thought about adding vodka to the pie crust. Such an interesting touch. Ninette, I couldn't find a "poor ugly pie" no matter how hard I looked. Vodka pie crust!!!! I am so going to try this. That pie looks good and I like rustic looking pies! And I love apple sin particular. 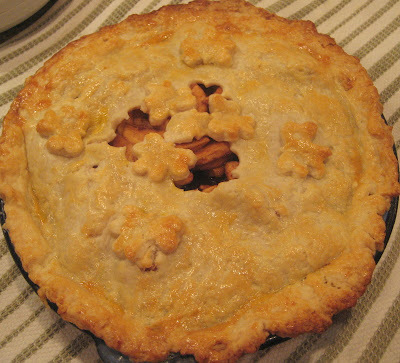 Wish I was energetic enough to make one right now :)Inthink I'm craving apple pie.